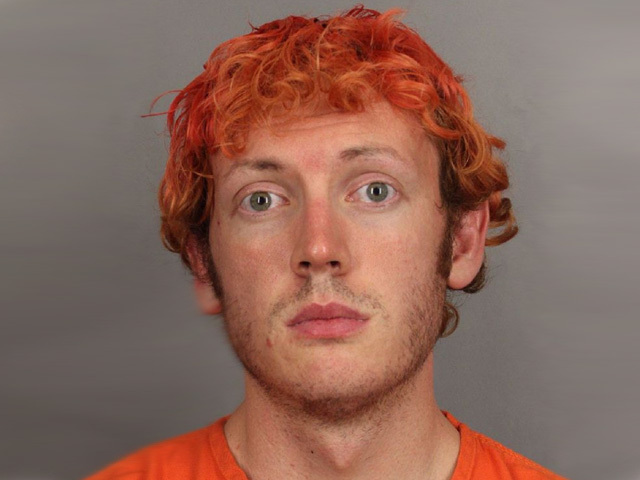 (CBS News) The Arapahoe County Sheriff's Office in Colorado released the booking photo of movie theater shooting suspect James Holmes from when he was apprehended by police early Friday. The 24-year-old is accused of opening fire at a movie theater in Aurora on a midnight showing of "The Dark Knight Rises," killing 12 and injuring 58, some critically. The photo's release comes a few hours after Holmes made his first appearance in court in Centennial, Colo. Monday. Wearing orange-red hair and looking at times emotional and at other times bleary-eyed, Holmes sat in a maroon jailhouse jumpsuit as Chief Judge William Sylvester advised him of the case. Authorities say Holmes is not cooperating and it could take months to learn what motivated the mass shooting spree. Below is video from Holmes' first appearance in court on Monday.